Wow, he’s finally finished, I’m so excited to share my realistic amigurumi hedgehog, just look at him! My editor commented in the pattern ‘it almost hurts to see the needle!’. I think that is the best compliment I have ever gotten. And I am so excited to share this pattern because I’m absolutely fond of the result. This little hedgehog looks so real I even surprised myself. Sometimes you have an idea, and you’re not sure it will work out, but this did – well, in the end it did! 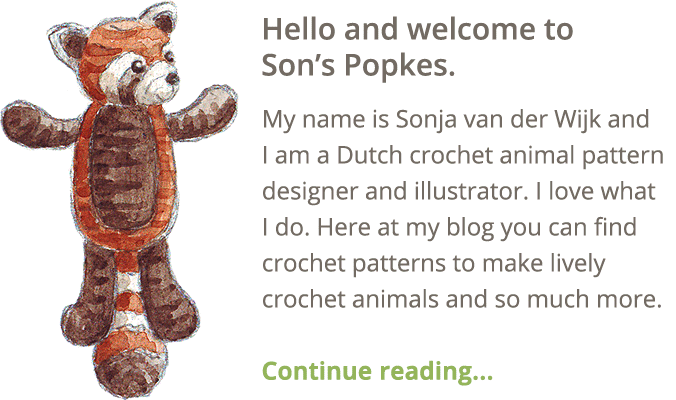 I love creating playful doll-looking crochet animal patterns but it’s also challenging to create a realistic animal every now and then. 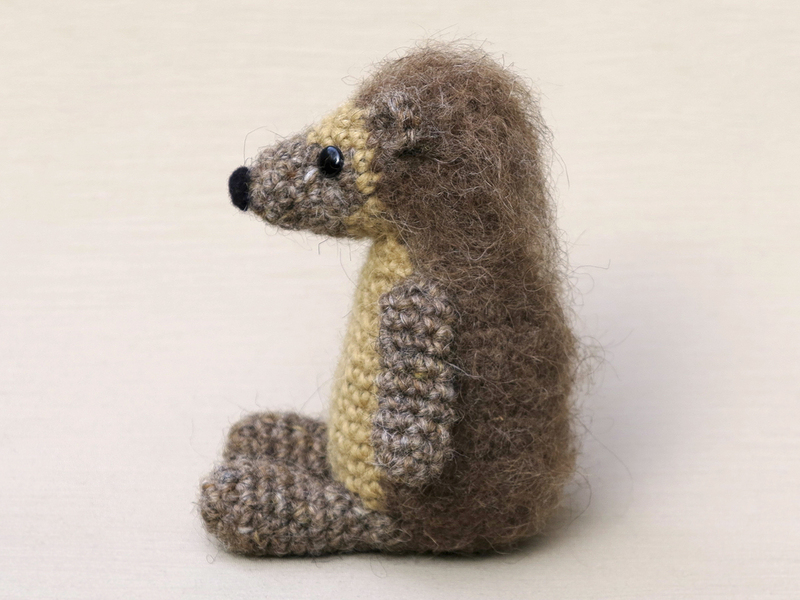 When this Summer a gorgeous little hedgehog visited our garden every evening, I knew I had to design a realistic crochet version. Hedgehogs do not have the most complex body shape, they basically are an oval-shape on paws. But they do have those prickly spines that makes them a huge challenge to create from yarn. But there I had this little advantage, I have a hedgehog plush with double coloured hair that looks very realistic. That gave me the idea to use two colours of lace yarn held together as one strand, to get a similar look. I also knew I had to use ‘cut loop stitches’ to get the most perfect result. And that is when the story began. 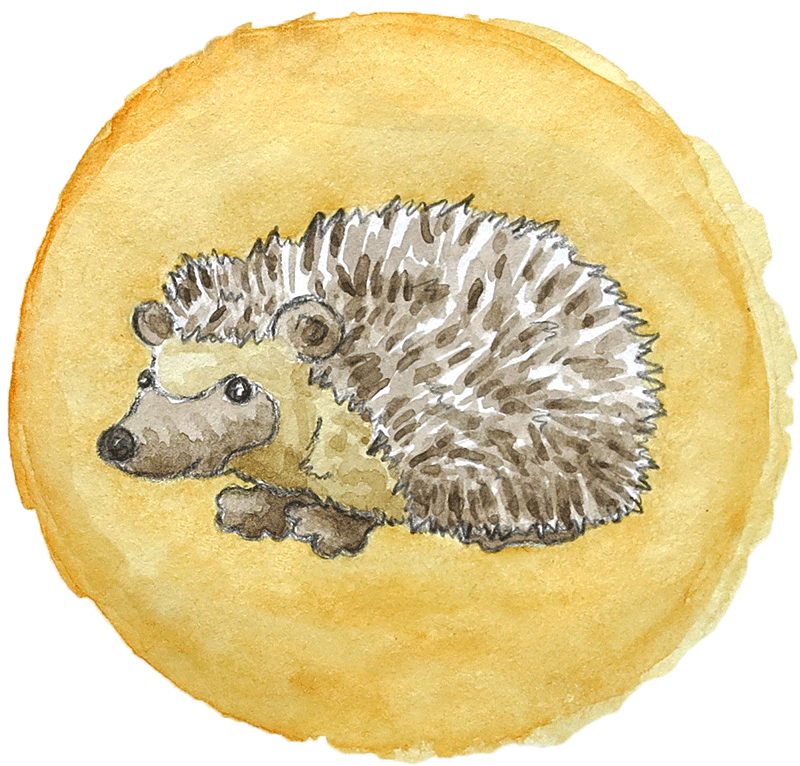 I started by making a nice looking hedgehog head, based on Flims’s head. My idea was to crochet the head and body in one piece and then to add the spines like a tortoise shell. When you crochet the loop stitch, the loops will form on the inside of your work, and turning around a two-coloured head was not an option. The spined-shell had to be attached later. But the idea of a shell didn’t work out. My shell stayed flat and I could not get it tortoiseshell shaped….shoot. I had to come up with something different. After some consideration I decided to make the head and body as separate pieces, so I could crochet the body the wrong side up. That was easier said than done. Designing a two-coloured body in loop stitches the wrong side up means you have practically no idea about the result when you turn it around and have cut the loops. Let’s just say you crafters are very blessed to have a pattern to follow. When I had finally managed to get a good proportioned body, I cut the spines too short and had to make another one. It was a good opportunity to test my own instructions. I had already seen how the hedgehog was going to look and that made me very enthusiastic. When the new body was finished, all I had to do was to design some cute footsies with little toes, and the hedgehog was finished. And I am so proud and happy with the result. 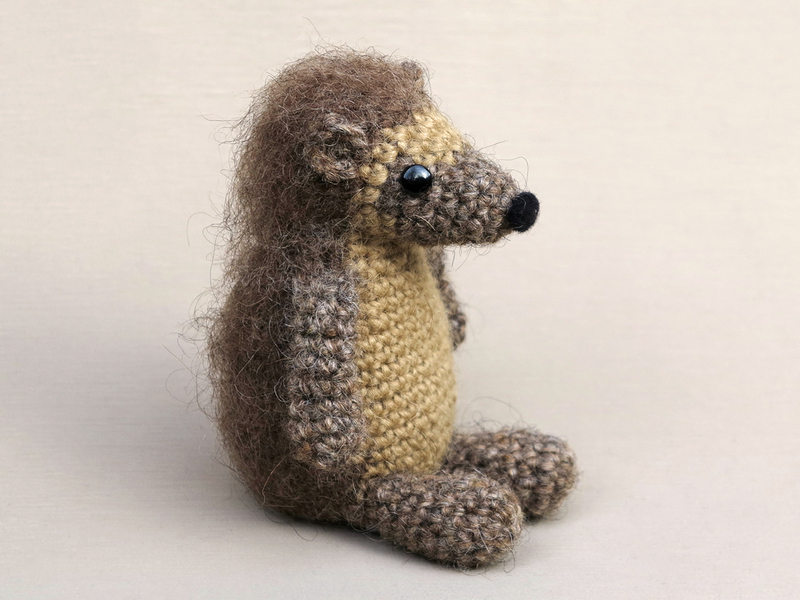 Here are some more pictures of this cuddly prickly crochet hedgehog, and below them you can find all the info you need. 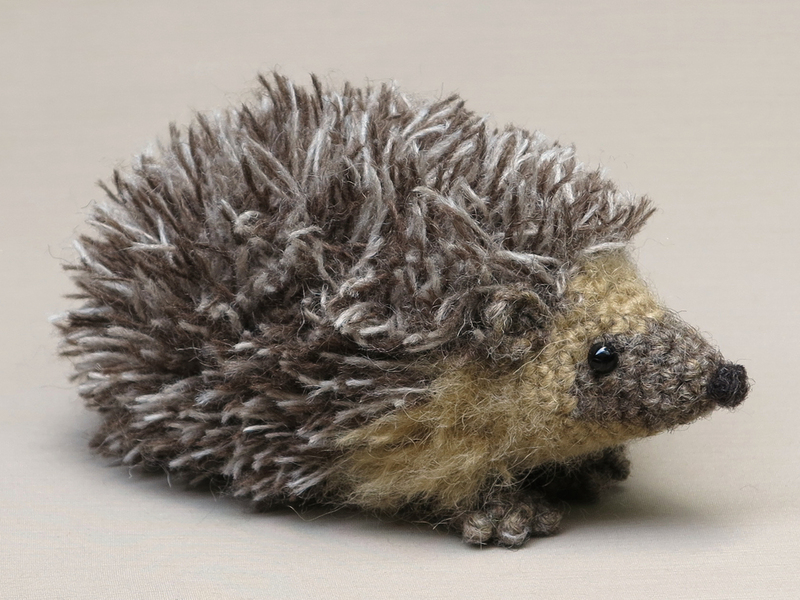 This realistic crochet hedgehog is made with Istex Lett Lopi and Einband Lopi, a 100% wool with a lot of fuzziness. He is 6.5 inch / 16.5 cm long from nose to bottom when made with this yarn. This isn’t a very difficult animal to crochet, even the loop stitch is quite easy when you get the hang of it, but cutting and modelling the spines does require your own skill together with the instructions in the pattern. 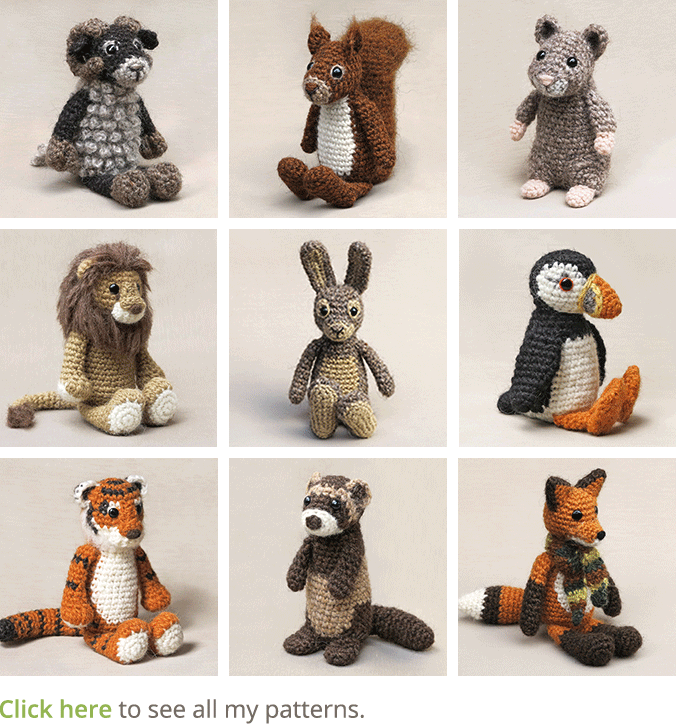 The pattern contains a clear and colour-coded description of how to crochet and assemble this animal, with extra illustrations and example pictures at the bottom to help you get everything right. 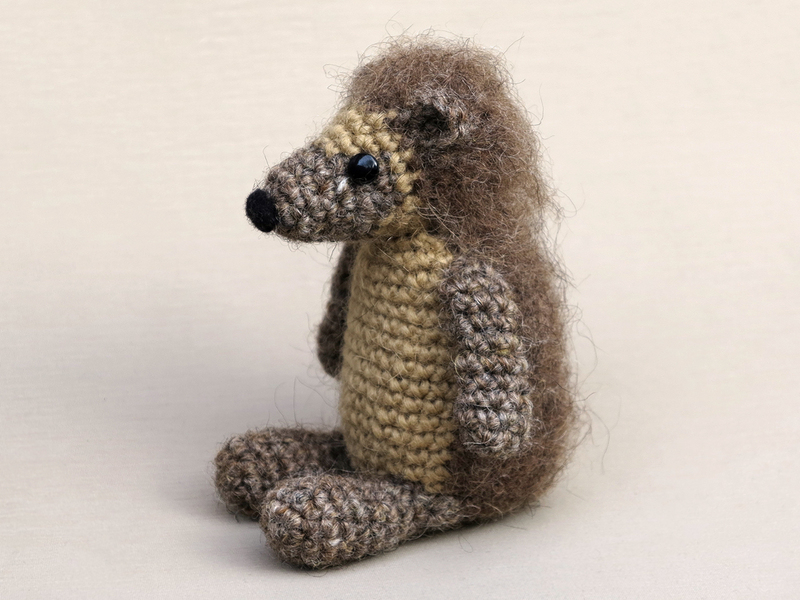 In the pattern you can also find what materials you need, the yarn colour numbers, in short, everything you need to know to make your own realistic hedgehog amigurumi. All the additional information you need to know about this pattern you can find in the shop listings. You can buy this pattern in my shop at Craftsy and in my shop at Ravelry or order it here. 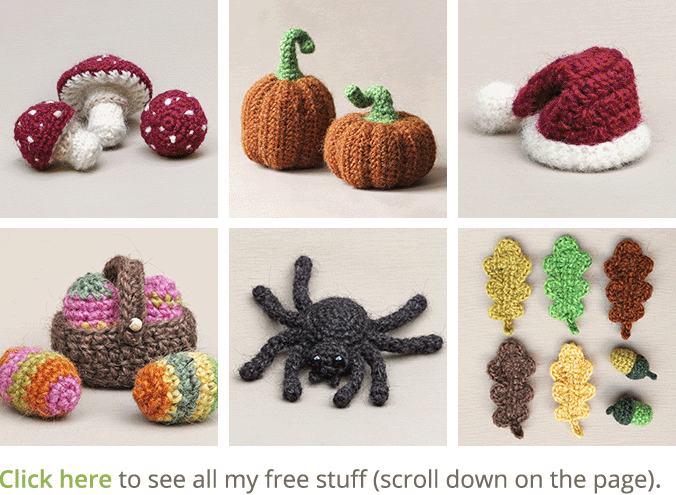 This pattern has a one dollar release discount till Monday the 8th of October!